The human spirit and the need for personal salvation. God created humans with the ability to know him but we rebelled against him. We were warned: "but you must not eat from the tree of the knowledge of good and evil, for when you eat from it you will certainly die." (Genesis 2:17). We did eat of it and we certainly die, we die physically and we are spiritually dead. Sin ("iniquities") separates us from God. The Bible notes that each human is made of a "spirit, soul and body" (1 Thessalonians 5:23). The spirit should be the control centre, the innate conscience. 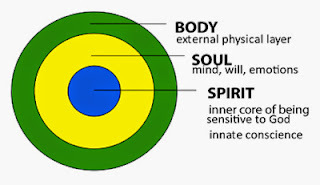 The spirit is the inner core of the human being that is sensitive to God. The soul is the mind, will and emotions of the person. The body is the external physical person. Without the restraint of our spirit, the soul and body are out of moral control: "dead in [our] transgressions and sins" (Ephesians 2:1) as the Bible puts it.